This will allow you to edit the shortcuts that are used to quickly add objects with a certain logic type to your level. Note: I never used this feature because it is easier to just copy an existing object and paste it to a new location. 'Edit' is somewhat of a misnomer, since clicking on this menu item will open up a dialog box which will allow you to add new entriez to the sub-menu below it. Assumption: empty template, no existing logics at all ... so you may see exactly what will happen. There doesn't appear to be an easy way to 'Undo' these changez. Type into box #0 "TileTriggerSwitch"
Click on the ToolBar menu item "Logics"
Note that the first (ghosted) "Add Logic" menu item is no longer ghosted, and showz instead "Add: TileTriggerSwitch ... Alt+0"
Click on the Tile at X=1, Y=1, and press the key combination "Alt" and "0"
Notice there is now a Yellow 'smiley face' in that place. Right-click on the smiley face, and an "Edit Objects" dialog box will open, with "TileTriggerSwitch" in the "Logic:" box ... "Image Set:" will be empty. Use the drop-down menu in the "Image Set:" box and scroll down to select "GAME_WAPWORLDONLY_SWITCH" ... the string will appear in the box. The smiley face is now a black bordered box with an "S" inside it on a white background ... a valid Switch logic (except it needz a CalcCowID to be usable. Click on the Tile at X=2, Y=2, and press the key combination "Alt" and "0"
Note the black bordered box with an "S" inside it on a white background ... a valid Switch logic! Now see if you can create the associated "TileTrigger" shortcut for yourself! 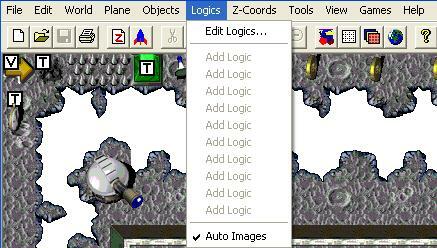 This feature (when toggled on) will try to automatically assign an image to an object that is only given a logic name. For example, if I add a new object with the logic name "EyeCandy" and don't assign an image set, the editor will try to automatically assign an image set that was used by a previous object that had the logic name "EyeCandy". Note: This feature never seemed to be very useful, because it either didn't work or it would just assign an image set that I didn't want.